Geisel Library is set to open a new cafe this spring as part of the Geisel Library Revitalization Initiative, the University Office of the Librarian announced Thursday on their website. Named after the GLRI’s primary donor, Audrey Geisel, Audrey’s Cafe will be situated on the second floor East Wing. The construction of the cafe is expected to be finalized mid-to-late May and opened to the public sometime thereafter. According to Brian Schottlaender, The Audrey Geisel University Librarian, building the cafe was a practical choice, and it will increase the friendly atmosphere found in Geisel. Initially, Audrey’s Cafe will be open between 7:30 a.m. to 10 p.m. from Monday to Thursday and have shorter hours over the weekend. During finals week, however, the vendor will stay open until midnight. Furthermore, UCSD’s Sports Facilities will manage the shop. Despite being run by a campus department, the cafe will only accept Triton cash, not dining dollars. In addition to Sports Facilities, Cafe Virtuoso, a local, independent roaster, and Bread & Cie, a San Diego bakery and cafe, will assist Audrey’s Cafe by stocking the cafe with food and drinks. This involvement of local businesses is what sets the cafe apart from other on-campus coffee spots, Director of Sports Facilities Planning and Management Don Chadwick explained to the Guardian. Chadwick also noted that the coffee shop will be largely staffed by UCSD students, creating a number of job opportunities on campus. The idea of Audrey’s Cafe resonates well with Revelle College senior Brittany Factura, who expressed to the UCSD Guardian that having a coffee shop in Geisel will make it easier for students to buy drinks and food. A second Revelle College senior, Sean Wenzel, also approved of the upcoming coffee shop because it provides an opportunity for students to take a break from studying. “A cafe would also lighten the atmosphere at Geisel and serve as a place for students to escape from their academic stresses for a bit,” Wenzel added. However, Muir College sophomore Yolanda Ruiz, stated that there could be some drawbacks to having the coffee shop located inside the library. Generally though, the idea of a coffee shop in Geisel has gone over well with students, Library Communications and Engagement Director Dolores Davies told the UCSD Guardian. The creation of Audrey’s Cafe was made possible by a $3 million donation from Audrey Geisel, a benefactor of the library and the wife of author Dr. Seuss, to the GLRI in July 2015. Schottlaender stated that Mrs. Geisel’s gift to the GLRI, a project to improve the library’s interior, sped up the establishment of the cafe. 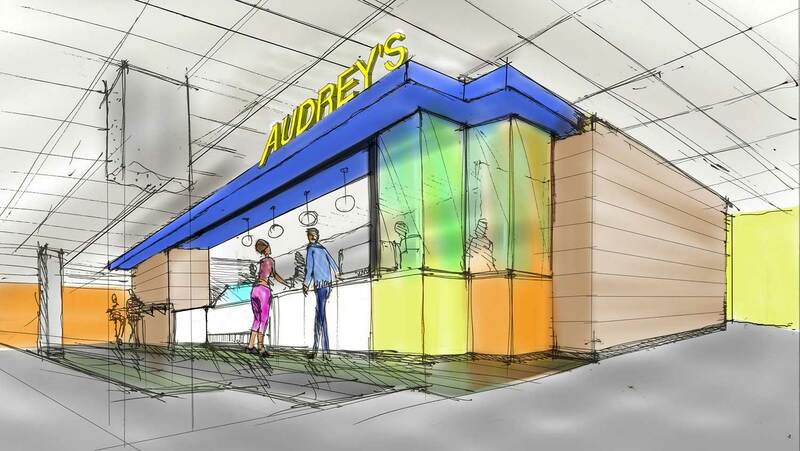 Audrey’s Cafe is one of many updates that will be made to Geisel under the GLRI. The library will also be outfitted with new carpets, furniture, finishes and technological enhancements.